Find a great variety of ways of asking questions which make 8. 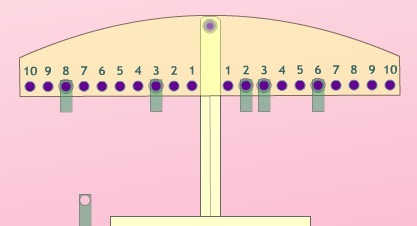 It is a number balance, sometimes it's called a "Balance Bar" and sometimes an "Equalizer". If you like this idea try "Number Balance ", then return here. Now this challenge is about getting the balance. Rule : All the while you can only have one weight at each numeral on the balance. Let's start by saying that on one side of the balance, place two weights and keep them there. 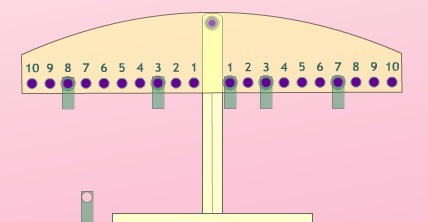 Make it balance by placing $3$ weights on the other side (remember only one at each numeral!). So choose your two places on one side and find many different balance places on the other side. When you've done all you can, it might be an idea to choose another (maybe higher) pair of numbers for one side and find all the ways of placing $3$ weights on the other side. Are you recording your results? If so, how? Combinations. Introducing algebra. Practical Activity. Working systematically. Games. Compound transformations. Interactivities. Visualising. Addition & subtraction. Investigations.